In the turquoise waters of the Caribbean, something lethal is on the move. Scuba divers travel from all over the world to visit the little island of Bonaire, with its crystal-clear waters and a host of beautiful marine life. After three years in the “Diver’s Paradise”, divemaster Boone Fischer thought he’d seen it all; but on a routine afternoon dive, he spots something that will turn his tranquil life upside down. From the arid shores of the ABC Islands to the tropical jungles of Venezuela—from the ocean depths of the Southern Caribbean, to the lush islands of the Northern Leewards, Deep Shadow takes Boone and the reader on an action-packed adventure filled with danger and suspense. 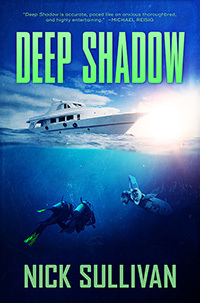 Deep Shadow is book one of the Caribbean Dive Adventures series. It is available now in print, kindle, or audiobook. Born in East Tennessee, Nick Sullivan has spent most of his adult life as an actor in New York City, working in theater, television, film, and audiobooks. After narrating hundreds of books over the last twenty years, he decided to write his own. 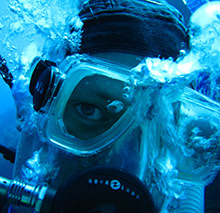 Nick has been an avid scuba diver for many years and his travels to numerous Caribbean islands have inspired this series. His first novel, Zombie Bigfoot, hit #1 in Horror Comedy on Amazon.